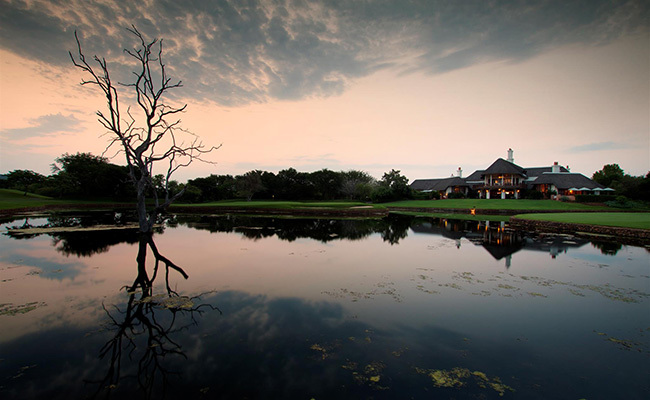 South Africa is known for its world-class hospitality, and Leopard Creek is no different. Arriving at the private estate, we were greeted with a warm smile and a review of the list, where our names were checked off. Booking ahead of time is essential and often by invitation. A lovely 5-minute drive into the private estate, we arrived into the parking lot, where we were greeted with champagne and mimosas. Attentive staff took our golf shoes and showed us around to the pro shop to complete check-in. Our shoes were cleaned and ready for us to pick up before we headed out to the first tee. I’m not just talking about the golf game here, but the wildlife that wanders the course! Leopard Creek is located on the very edge of Kruger National Park, which is perhaps the most famous safari destination in all of Africa. (Note: Kruger and Leopard Creek are located in a malaria risk zone, so be sure to consult your doctor for advice on malaria medication.) The course is set on a plateau overlooking the vast expanse of wilderness, creating a view like nothing else on Earth. Be sure to take your camera so you can capture the wildlife, amazing vistas, and dramatic landscapes you’re bound to see throughout the day. The first thing you will notice as you arrive at each tee box are the bronze statues of leopards, each unique and breathtaking. 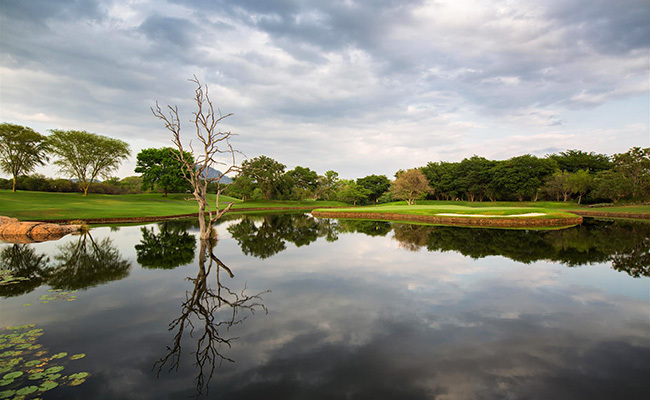 The course is in exceptional shape and it is not uncommon to spot wildlife like antelope, giraffes, and warthogs crossing the fairways. The 13th hole was one of my favorites: a 505 m par-5, with a green perched on the cliff’s edge, overlooking the Crocodile River in Kruger. A herd of elephants strolled by on the plateau below, the babies trumpeting as they followed in their mother’s footsteps. How often can you say you’ve seen that during a game? My second favorite was a par-3 hole with a tee shot overwater. Resident hippo Harry lives in the water and is eager to try and rattle your cage! This was a tee shot I’ll never forget. The design of the course allows for streams and waterways to come into play during your round, and the downhill par-5 18th toward the club house has an island green, keeping you focused to the very end. The club house has a wonderful bar and outside patio overlooking the 9th and 18th island greens. Allow ample time to browse the well-stocked pro shop and to explore the entire club house; the attention to detail and interesting textures make the club house a masterpiece in its own right. A round of golf includes greens fees and golf carts. Rental clubs are available upon booking request. All guests are required to adhere to the club’s dress code, which you can find here. 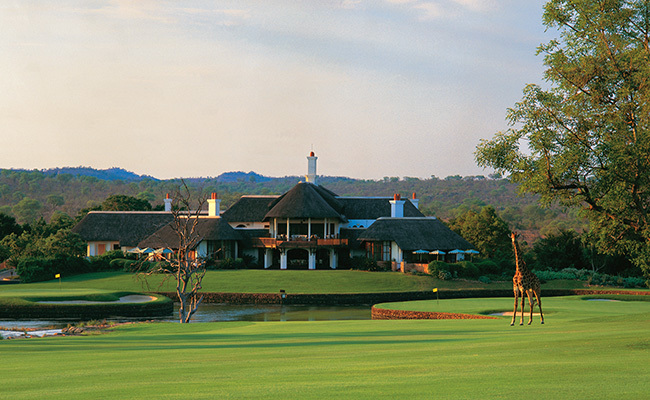 Want to plan a golf getaway to South Africa? 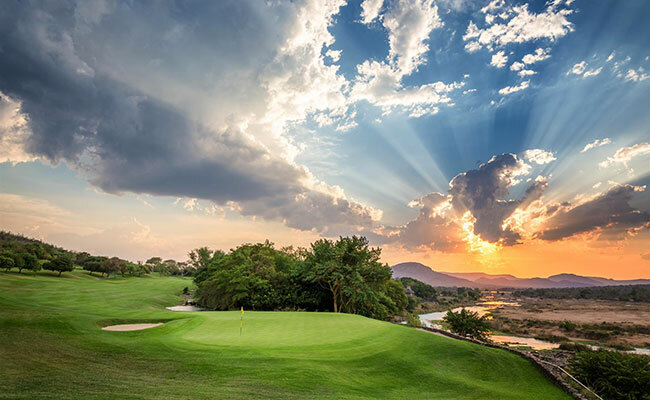 Please reach out to me at cgoodman@africaendeavours.com or call me at (888) 367-0933; I’d love to chat about Leopard Creek, as well as the other lovely golf courses I’ve played in South Africa, and help you plan your trip!